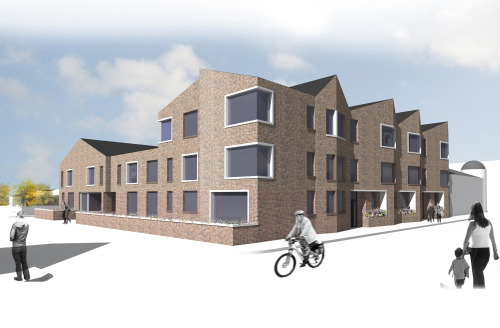 Collective Architecture’s proposals for housing at Carville Road, Wallsend were granted planning approval this week. The development comprises of 20 one and two bedroom flats for social rent. Locally sourced materials have been chosen to be robust and sympathetic to the surrounding buildings. A textured, multi hued facing brick has been chosen to create a sculptural quality with contrasting white precast surrounds introduced to key windows provide a distinct feature. We look forward to working with Home Group to deliver the project in 2014.